To maximise your payload North Star engineering team will work with you to ensure your truck and rigid body combination meet legal dimensional requirements and maximum payloads. All NorthStar Trailers 100% Australian made to the highest quality. We offer a 1 Year Warranty. Side Profile	Rear-2.1mt (7), Front-1.8mt (6) 3.2mm 450 Hardox. Standard PBR Air fittings, 7 pin large round, EBS Multivolt mounted front of chassis. High Quality 50 Tonne Hoist with CBS valve. Axles-Fuwa K Hitch F2000 10/285 Steel drum brakes. Suspension- Fuwa K Hitch Airbag (with suspension dump). EBS brakes (includes load sense & roll stability). EBS Smart board with hubodometer & weight gauge. Fitted with a high quality PVC roll over with spline adjustable handle. The Tarp has Flexi bows and Front and Rear hoods. All Hella LED lights are fitted as standard to the ADR requirements including one Tailgate work light bar. Poly mud guards over axle group, mud flaps across rear. -Front access submarine style door. -Swing out ladder on rear for easy access. -Heavy duty roll tarp with all reinforcing and tarpoon. 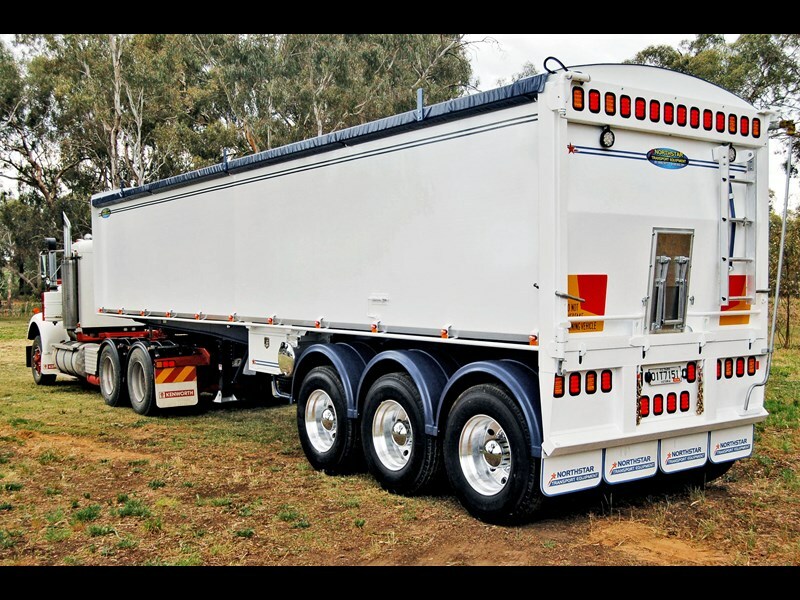 NorthStar 2019 Grain Semi Tipper NORTHSTAR GRAIN SPEC SEMI TIPPERS North Star Transport Equipment custom-made Chassis Tipper trailers are manufactured to suit your requirements. North Star Semi Tippers are a quality product made for Australian roads. To maximise your payload North Star engineering team will work with you to ensure your truck and rigid body combination meet legal dimensional requirements and maximum payloads.